The finest kabuki brush available for flawless coverage. The difference is in the softness, length, and density of the brush hairs which determine how they glide across your skin. Long lasting and washable. A kabuki brush is the ultimate tool for perfect application of foundations and finishing powders. Brushes are not created equal. There are many varieties of kabuki brushes available, but there is no finer version than this one. We know; we have tried them all. This is the finest kabuki brush available. The difference is in the softness, length, and density of the brush hairs which determine how they glide across your skin. The softest hairs will result in a flawless surface. 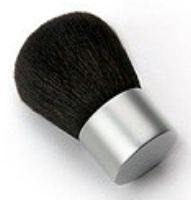 This kabuki brush is just right density to insure just right coverage. The luscious kabuki evenly and effectively delivers foundation powders to your skin and melds them into your pores. Also use the kabuki to deliver camouflage cover to the back of your hands to hide age spots, or on your legs to make spider veins or bruises disappear. Quality brushes are worth the cost. Wash frequently. If the brush starts to pull on your skin, washing will solve this. Use any shampoo or bar soap to clean your brushes. Air dry.